The UK’s tallest sculpture, The Arcelor Mittal stands at 114.5 metres tall and towers above the Queen Elizabeth Olympic Park. Offering a fantastic view of London, with sightlines up to 20 miles away, the London skyline has never looked so good – Big Ben, The Shard and the Gherkin are all clearly visible from the viewing platform, as well as the Walkie Talkie and the Cheesegrater buildlings. For the football fans amongst you, five of London’s most famous football stadiums can be seen. Relive memories of the 2012 London Olympics with views of the London Aquatics Centre, the Lee Valley Velodrome and, of course, the iconic Olympic Stadium. Interactive touchscreens with Gigapixel Technology guide you through the view, from the impressive lines of Canary Wharf through to the arch of Wembley Stadium. And now there’s a new way of getting down from the observation platform. Stairs are tedious, and the lift is boring. Why not try The Slide! 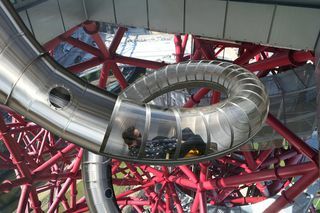 Travelling a distance of 178m, The Slide at the Arcelor Mittal Orbit is the longest tunnel slide in the world, as well as the tallest! Intertwined with the sculpture, travel through light and dark sections with the London skyscape rushing by dramatically as you reach speeds of 15 miles per hour! With 12 twists and turns, a corkscrew section and the final 50 metre straight run to the ground, this 40-second ride is an exhilarating finale to your Arcelor Mittal Orbit experience. 1. Visitors using The Slide must…..
3. The use of personal go-pros, cameras, phones, other electronic devices and unofficial recording equipment on The Slide are not permitted. 4. If they have a heart condition, back or neck injuries, claustrophobia, vertigo, epilepsy, if they are pregnant or if they have any condition that prevents them from following all of the safety rules and guidelines, they must not ride The Slide. 6. Each ticket is valid for one use of The Slide only. 7. Visitors who are disabled or who require adaptions to accommodate any additional needs are asked to contact the ArcelorMittal Orbit prior to booking. 8. Visitors must follow the instruction of the ArcelorMittal Orbit staff at all time. They refuse the right to refuse entry of The Slide for operational or health & safety reasons.